My daughter Lily enjoyed writing on my blog so much last week that she decided Saturday is her day on Lemon Drop Pie. Here she is, writing again! Hi, it’s Lily. 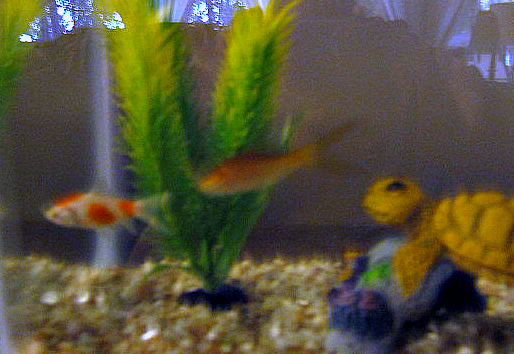 I have two pet goldfish, Stripe and Spotty. I got them on Aug. 5, 2012. One week after that Spotty died. I was sad. Stripe hates the net. He loves food. Spotty did not mind the net. She liked food. I do not like the smell of goldfish food. I help take care of them. I love them. And Stripe says,”Feed Me! Please!” They are so cute. It's so cute that your daughter is getting involved with your blog. I'm returning the blog love from your comment from a week ago on Happy Moms, Happy Homes. I finally added a new post in the series "Money on the Move." Enjoy your day! Lily is a talented writer! Aww, I love it! R.I.P Spotty! I hope you guys had a great Monday! Hi Lily! So sweet! Keep writing! 🙂 … Ginny! This is so sweet! 😉 Thanks for sharing! My recent post Christmas Cookie Series – Haystacks! I am so smiley over this cute post! I'm sorry to hear about Spotty. I like the little turtle that keeps Stripe company! Thank you!The turtle is fake and it is a tunnel. I used to look after some cats and their food smelt very funny too. And I heard some people actually eat cat food! I wonder if there are people eating fish food. And if they did, would they become mermaids? Great job, Lily! Pets teach us many important lessons about life. Enjoy! (I can't stand the smell of goldfish food either!) Can't wait to read what you write next Saturday!